Boston, MA: Local artists Katha Seidman and Laurie Kaplowitz are set to unveil a unique collaboration this fall at the South Shore Arts Center. Opening September 16 in Cohasset, Once There Was a House: echoes from the Villa of the Mysteries is an exploration of what remains long after the life of a community collapses. 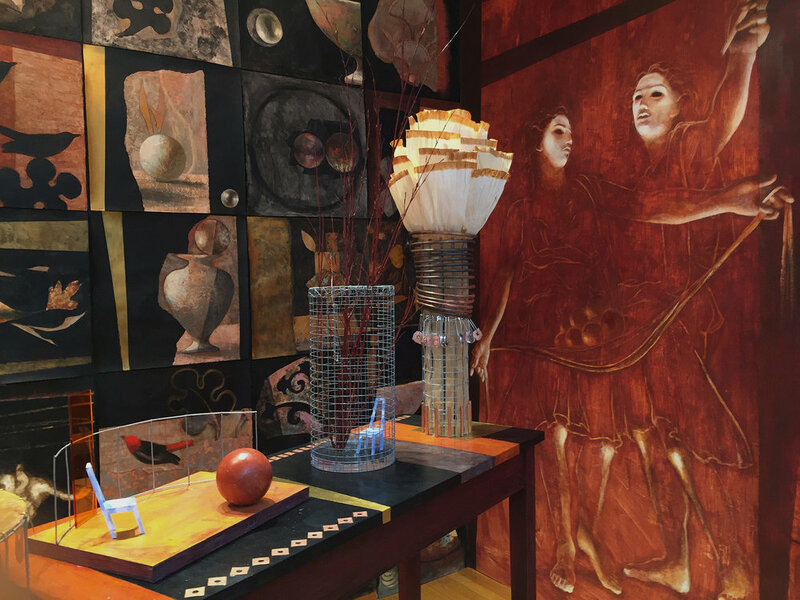 By skillfully integrating their artistic visions and signature styles Seidman and Kaplowitz reimagine the upheaval and disorientation that engulfed a Roman home’s human and spirit inhabitants when struck by catastrophe. Drawing inspiration from the famed Villa of the Mysteries buried 2000 years ago by Mt. Vesuvius’ disastrous eruption that entombed Pompeii, their installation taps the fears and anxieties we all harbor about the fragility of our own daily lives. This exciting and dynamic three-dimensional narrative spotlights white-faced figures, frozen in the ash of the collapse staring out from domestic doorways and windows in murals that cover the walls. Nine-foot tall spectral figures, mystical in elegant drapery and ornaments, move around an arid courtyard. And in a secluded corner, intimate offerings connect the home's inhabitants with its sprits. The architecture of the “house” is summarized by a periphery of door and window frames, portals through which we can both contemplate and “enter” the past. “The Villa of the Mysteries is many things: it’s art, it’s history, it’s a particular moment of daily life crystalized in time,” explains Kaplowitz. Seidman adds, “Given our current anxiety about cataclysmic change and how it affects communities around the globe, for us it also became a signpost to an understanding of our present fears for our future.” Resonant with rich color and texture, Seidman and Kaplowitz’s collaboration has produced an immersive environment that impels us to consider the domestic, cultural, and artistic footprint we all leave behind. As an individual artist Kaplowitz’s work uses the figure to explore nature and existence. Her work has been exhibited in commercial galleries in Los Angeles, New York, Dallas, and San Francisco, as well as many museums such as the DeCordova Sculpture Park and Museum, the Fogg Art Museum, the New Bedford Art Museum, the Katzen Arts Center (Washington, DC), and others. She is represented by Fresh Paint Art Associates in Culver City, CA. Seidman’s work focuses on the complexity of nature, the power of place, and the desire to tell commanding stories. While continuing to show her artwork, Seidman has received two Emmy Awards and five nominations for television production design.